Dr Liisa Kauppinen awarded an honorary doctorate at Trinity College Dublin. Dr Liisa Kauppinen is awarded an honorary doctorate (Doctor in Laws LL.D) at Trinity College Dublin. She was nominated by Professor Lorraine Leeson, Centre of Deaf Studies Director at the School of Linguistics Speech and Communication Sciences at TCD. Dr Kauppinen was CEO of the Finnish Association of the Deaf for 30 years, General Secretary and President of the World Federation of the Deaf (WFD) and served as the permanent WFD representative to the United Nations for 20 years. She still continues to serve as an expert for the General Secretariat of the WFD. She has been a major inspiration to deaf communities internationally, and an articulate and intelligent ‘voice’ on the need to explicitly state the human rights of deaf people at national, European and global level, all the while decrying the lack of opportunities for education and training, the under-employment of deaf people, and the lack of recognition of signed languages as ‘real’ languages. She has supported the development of deaf self-advocacy in Ireland and was a key supporter of the move to establish a Centre for Deaf Studies at Trinity College in 2001/02. The World Federation of the Deaf have been supporters of many of the project which Interesource Group have been involved in and the project teams wholeheartedly congratulate Dr Kauppinen at this wonderful achievement and recognition of her global contribution. 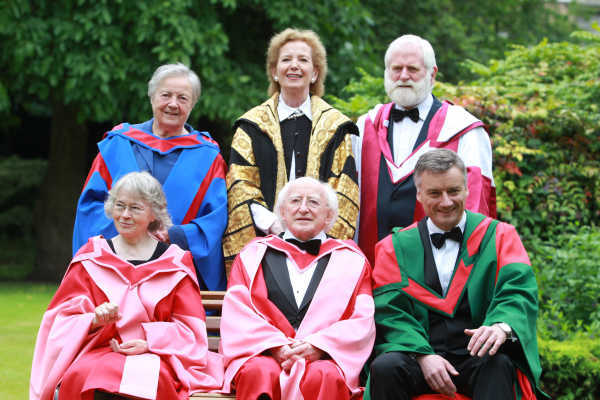 President of Ireland, Michael D Higgins, Irish Historian, Margaret Mac Curtain, The Dubliners’ John Sheahan were also conferred with Honorary Degrees. Back row from left: Irish Historian Dr Margaret Mac Curtain, Chancellor of the University Mary Robinson, Musician and Composer John Sheahan. Bottom row, from left: former CEO of the Finnish Association of the Deaf Dr Liisa Kauppinen, Squee and Provost Patrick Prendergast.